Northampton School for Girls pupil Williams produced a brilliant 1500m performance at Watford tack at their graded open meeting. 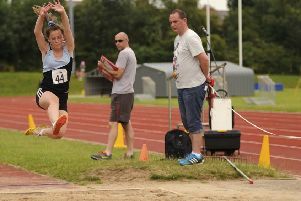 Such was the strength of the performance of Williams, who runs for the Kettering Town Harriers, that she also moves to third on the all-time UK ranking list for bottom year U17s, and amazingly to fifth in the world rankings for 15 to 17-year-olds. This is an astonishing feat for an athlete who has just turned 15. The race was ran in near perfect conditions and went to plan with a target of 2:18 at 800m and with the knowledge that a time at the bell of 3:10-3:15 would mean she was on target to challenge for the UK top spot and better her personal best and club record for the third time this season. Northampton-born Williams split at 3:13 and then produced a superb 67 last lap to smash her PB by six seconds. Coach Shane Smith said: “Emily has worked so hard in training over the past nine months, really upping her game, and she absolutely deserves the current success she is enjoying. “Emily is at the fore of a hugely talented crop of bottom year U17 Women in both the 1500 and 800m in the UK who are trading blows week by week to head the UK rankings. Williams’ next challenge was the BMC PB classic in Milton Keynes where she was competing head to head with the current UK number one, Molly Canham, in the Women’s A race, along with some top quality U20 Women. Williams ran a tactically superb race to sit in on the opening lap which was paced at 61 seconds, and splitting just off the pace maker at 63 seconds Williams moved through on the back straight after the bell to close in on her main rival, and kicking decisively with 150m to go she surged past Canham and powered her way to second place behind U20 Khahisa Mhlanga. It meant she defeated Canham for the first time on track and in doing so move ahead of her in the rankings with a super-fast 2:07.46. This was an outstanding performance to cap a magical week for Williams. “I am so pleased about how the last week has gone,” said Williams. Williams now heads into the final preparation phase of her track season before the National Championships in a buoyant mood. Rugby & Northampton finished third in a competitive British Athletics League Division Three event hosted in Chelmsford over the weekend, a result which keeps the club top of the overall standings after two matches. It was on the track where the club starred, with Kyle Ennis enjoying a highly successful day. He took first in the 100m and 200m A races with respective times of 10.72 and 21.72 seconds, and was part of the 4x100m relay team which finished in top spot in 42.75. Adel Sesay, Rico Ewer and Clinton Osoba-George made up the rest of that triumphant quartet, with Ewer also quickest in the 100m B in 10.97. Osoba-George and Sesay landed a one-two among non-scoring runners, with the former setting a season best of 11.18 before adding third in the 200m B, with 22.80. There was double joy in the 5000m where Jacob Allen’s 14:45.02 was a season best and ensured he was first over the line in the A, while Ben Musgrave set a PB of 15:49.77 to win the B string. Connor Aldridge set his best time of the season, recording 56.43 to take second in the 400m A hurdles, and there was a third spot in the B race for Charles Barker, courtesy of 61.94. In the field, Craig Murch took honours in the hammer throw, with a winning effort of 68.41 metres. Under-23 athlete Josh Arimoro impressed, with a personal best of 12.08 earning him second in the shot put, and he added a third-placed finish in the discus with an effort of 33.98m. Elsewhere, R&N athletes were in action at the Vitality London 10k, where Angela Copson set her 35th European Masters record. In winning the W70 category, Copson knocked 39 seconds off the previous record which has stood for 13 years with a gun time of 45 minutes and 11 seconds. The veteran athlete has now broken a British Record in three different distances for her age group so far in 2017, with one of them being a world best. Five of her club-mates were also taking part, with Zoe Shepherd leading them home in 44:22 (1305th). Then Copson (1434th) was followed home by Helen Jones (46:19 - 1779th), which placed her as the 20th W50. Minerva Chesser (2292nd) recorded 48:19 for 45th in the W40 category, Kate Williams (2929th) was the 15th W55 in 50:17, and completing the squad was Rebecca Hutson (8380th) in 1:04.31.